Synthetic chemist László Kürti and postdoctoral researchers Zhiwei Ma and Zhe Zhou reported their synthesis of unprotected aziridine molecules, key building blocks in synthetic chemistry. The lab's primary focus is to cut the number of steps it takes to synthesize nitrogen-containing chemical compounds. One way to do so is to simplify the synthesis of precursor molecules that can then be easily modified into products. "The vast majority of research done in aziridine chemistry concerns only the syntheses of various protected aziridines, which often cannot be further functionalized," Zhou said. "This simple method gives access to unprotected aziridines, which are much easier to functionalize." What's the difference between protected and unprotected aziridines? "The key is the nitrogen atom," he said. "When this nitrogen is connected to an electron-withdrawing group, the aziridine is protected, while connection to a hydrogen atom or alkyl groups gives rise to unprotected aziridines." The new work streamlines the process and eliminates the toxicity, Kürti said. 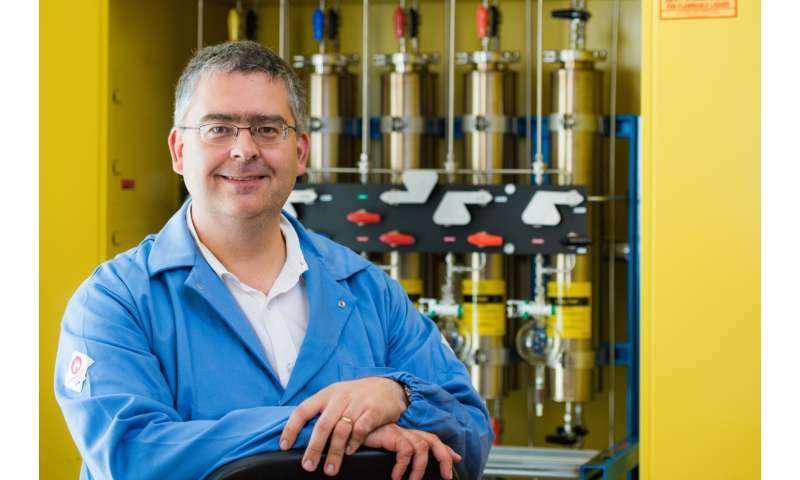 "We bring in a really cheap and readily available reagent, hydroxylamine O-sulfonic acid, and utilize it as an electrophilic nitrogen source for olefin aziridination reactions," he said. The resulting molecules are also stereospecific, Zhou said. "Stereospecificity means that if one takes an olefin into a reaction with a strictly defined double-bond geometry (cis- or trans), that geometry will be fully preserved at the end of the process."